Short summary: Ants do not plan picnics, not like you and I. But if you have a picnic, be sure they will stop by! 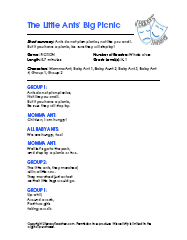 This Readers’ Theatre incorporates choral reading.